An aggregate fruit or etaerio (/ɛˈtɪərioʊ/) is a fruit that develops from the merger of several ovaries that were separate in a single flower. In contrast, a simple fruit develops from one ovary. In languages other than English, the meanings of aggregate and multiple fruit are reversed, so that aggregate fruits merge several flowers. The differences in meaning are due to a reversal in the terminology by John Lindley, which has been followed by most English-language authors. Not all flowers with multiple ovaries form aggregate fruit; the ovaries of some flowers do not become tightly joined together to make a larger fruit. Aggregate fruits may also be accessory fruits, in which parts of the flower other than the ovary become fleshy and form part of the fruit. The components of other aggregate fruit are more difficult to define. 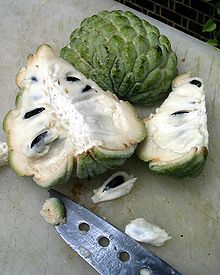 For example, sugar apple (Annona spp.) 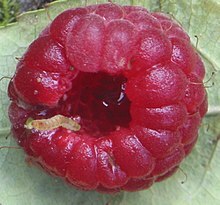 fruit are made up of individual berry-like pistils fused with the receptacle. ^ "Define Etaerio at Dictionary.com". Retrieved 2015-01-17. ^ a b Spjut, R.; Thieret, J. (1989). "Confusion between multiple and aggregate fruits". The Botanical Review. 55 (1): 53–72. doi:10.1007/bf02868781. ^ Janick, J.; Paull, R.E. (2008). The Encyclopedia of Fruit and Nuts. CABI. ISBN 9780851996387.